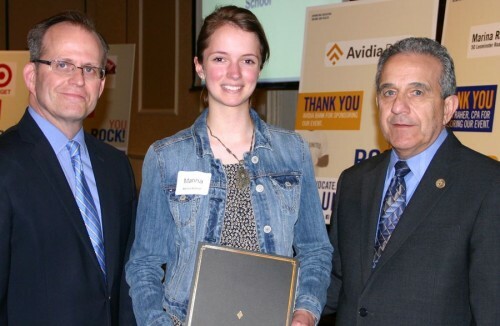 Each year the UWYV staff are proud to support outstanding Venturers by awarding $1,000 scholarships to graduating seniors who exemplify leadership and changemaking. Read about our previous scholarship winners below. Ethan started his Youth Venture, Holiday Spreaders, as a middle school student, when he and a few friends started visiting the Alzheimer’s Unit at Leominster Crossings. The group quickly developed a relationship with the patients and to date they have visited over 48 consecutive months, (more than 4 years without missing a month). Each month Holiday Spreaders identifies a holiday or special occasion to celebrate with the patients. Ethan has been so impacted by this experience that he has chosen Neurological Medicine as a college major, with a goal of curing Alzheimer Disease. Ethan’s Team has not only developed a relationship with the patients but with the staff as well. Ethan even acquired a part time job at Leominster Crossings as a dietary aide and has the opportunity to check in with his patients regularly. In October of 2016, Sam was brainstorming ways to better the community she lived in while having an impact that could be global. She stumbled upon the growing issues of the decline in honey bee populations. From there she looked into how she could put a team together that would help her educate the public and fundraise while also looking for an organization that would support her with this process. She found three other students who shared the same passion and at the same time found United Way Youth Venture. Samantha connected with Mary, the president of the Worcester County Beekeepers Association and received tremendous support from her. Samantha and her team hosted a Honey Festival and a Farmers Market and raised enough money to donate $1,000 to the Haagen Dazs Honey Bee Haven. Victoria is the treasurer of her Youth Venture team called PTSD. Their mission is focusing on providing support for those who are affected by PTSD in her area. Their goal is to raise money so that they can make care packages for those affected by PTSD. Included in these care packages will be a brain stress ball, a pack of gum, colored pencils, coloring pages and a happy jar filled with positive quotes inside. Victoria and her team also hope to spread awareness about PTSD, and held a fundraiser this past Veteran’s Day at the local town pub. They were able to coordinate a trvia night fundraiser with the restaurant’s weekly trivia night. It was a huge success with a packed house. 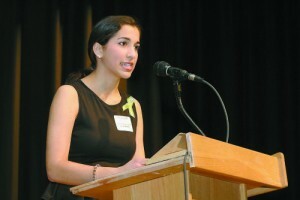 As a remarkable young student, one of Laura’s proudest accomplishments is the Youth Venture she co-founded called PLAY (Protecting Law Enforcement and Youth) which connects “at risk” youth with local police, opening dialogue about current misconceptions and reinforcing positive relationships within the community. Laura became a presenter of the Juvenile Justice Jeopardy game which she brings to urban areas to raise awareness of local street laws through fun, interactive assemblies. 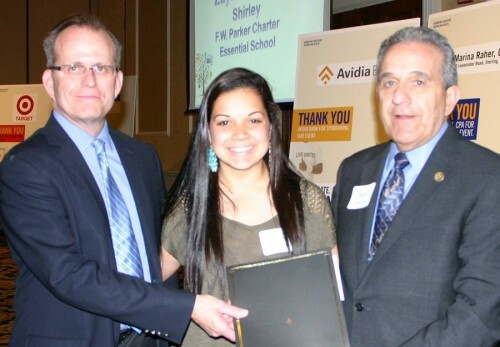 She has connected to Fitchburg and Leominster public schools, and the Springfield and Worcester Boys & Girls Clubs, earning her and her team the Changemakers of the Year award in 2016. Aidan suffered a serious concussion and had a diagnosis of Post-Concussion Syndrome in summer of 2015. Although Aidan could not be in an environment that allowed him to DJ for his Youth Venture, Sound of Murdock, due to the noise and lights, he had created enough of a base of volunteers to sustain the venture during his absence. He continued to support other ventures and be a part of planning and working as was permitted by his physician. Being in a community that has a low self-esteem is perhaps the biggest challenge for Murdock and Aidan. Aidan has consistently been a role model, a mentor, and a supporter of his community and venture. Sound of Murdock has DJ’d events both in town and at various events and schools in North Central Mass. 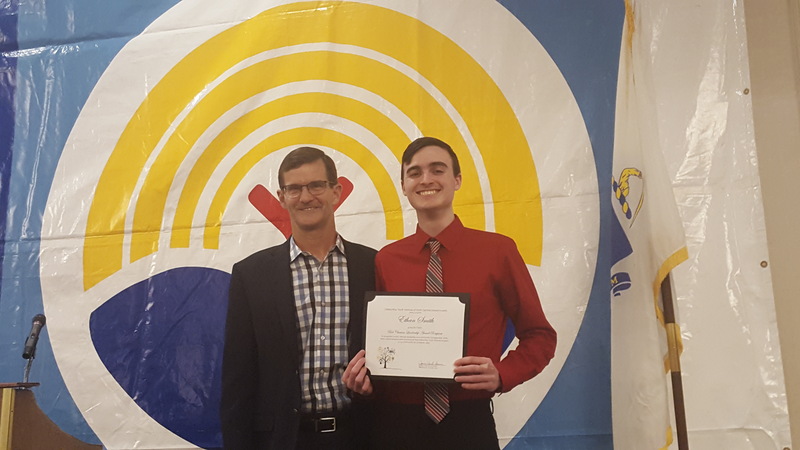 Aidan often steps back and allows others to be in the limelight for events, encouraging other students to step outside of their comfort zone and assume positions of leadership. For the Sound of Murdock, although Aidan loves to be the DJ he always lets other students take on the role so that there is a new generation of DJ’s for Sound of Murdock. Alex’s commitment to supporting others is evident in his founding of a Youth Venture after he tutored a student and saw her have success in a subject she struggled with. He, along with two other students, developed a student initiated after school tutoring center they called PIT (Peer Initiated Tutoring). They provide a place for students to be able to stay after school and study with their peers. They have available student tutors who can assist other students in a variety of subjects. 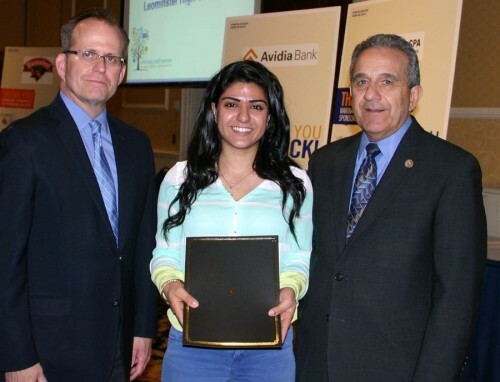 They opened their program last year and were very successful, earning them recognition in the Leominster High School academic community. 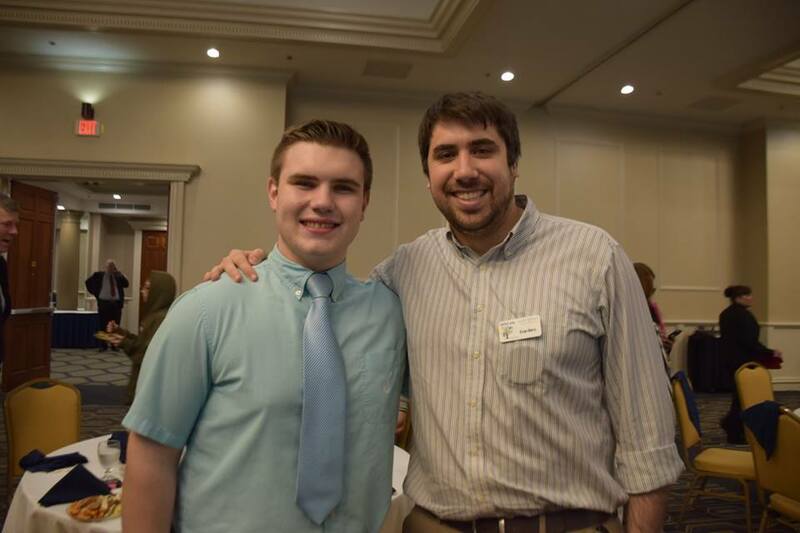 Alex’s commitment to the program is inspiring as he continues to work to make improvements and to increase the number of students involved as tutors. Saddened by the devastation that the earthquake had on the families of Haiti, Rafaela knew it was time to stop sitting around and stand up to help those who were in need. 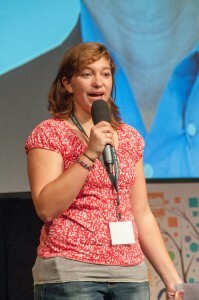 Through the creation of her Venture Team, GO Make A Difference!, Rafaela was determined to help the homeless both in Haiti and locally by raising donations of essential items for the families, hosting birthday parties for children whose families couldn’t afford it, and volunteering with the local Habitat for Humanity. 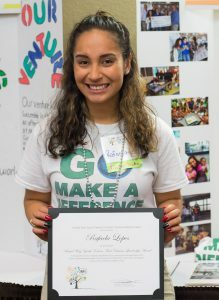 After gaining a whole new level of confidence and experience, Rafaela and her team were able to achieve one of their biggest goal’s and actually raise the funds to go to Haiti and serve as volunteers with the nonprofits helping the homeless affected by the earthquake. 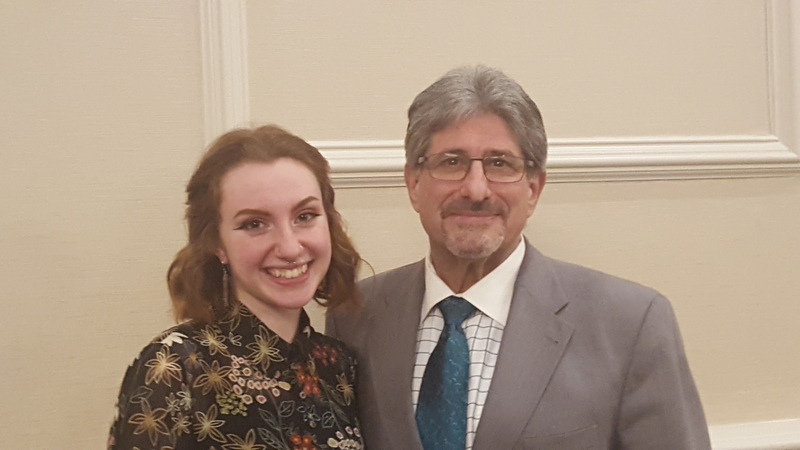 Since then, Rafaela has become an inspiration among the North Central Massachusetts community, having won the Campus Compact’s National 2016 Newman Civic Fellows Award and the inaugural Bob Chauvin Leadership scholarship. Along with Rafaela, Morgan has helped to make a big difference for the children of Haiti as a leader of the GO Make A Difference! Venture Team. Having never been abroad before, not only was Morgan able to support the needs of the children and families who were in desperate need for the team’s donations and assistance, but Morgan realized how valuable the UWYV experience was for her own growth on a personal level as she learned how to be involved in the community and develop a special bond with the children. Despite facing her own personal struggles, Morgan was able to overcome these roadblocks through sheer determination and will and a passion for helping those in need. As someone who was often more reserved in class compared to her fellow students, Maggie soon found her niche when she discovered her passion for serving others. 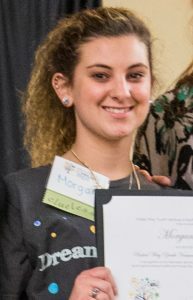 Through the United Way Youth Venture program, Maggie founded her own Venture Team called the Children’s Education Fund Program, working to help create scholarships for foster students who would often not have the funds or family connections to be able to afford to go to college. As an immigrant from Senegal, where she faced many of the same adversities which are faced by foster youth here in the US. In addition to helping foster youth get an education, Maggie was able to gain many of the skills to help her feel more confident and become a leader in the community and has passed her dreams for the Venture to her younger sister. Hannah Dike has been a leader of the Friends of Rachel’s Challenge Venture Team throughout her time at high school, serving as the President of the team for the last two years, as they helped to ensure that the entire LHS community will be prepared to recognize the signs of bullying and act as an ally to those in need. As a student who was unafraid to step up into the leadership role, also acting as the Student Council President in her senior year, Hannah exemplifies the type of leader that all Venturers are working to become. Through her four years at LHS, Hannah made it her mission to show that one person showing compassion to others will start a chain reaction throughout the school that will change its culture for good. Hannah is currently receiving her degree at Simmons College in the hopes of becoming a physical therapist. 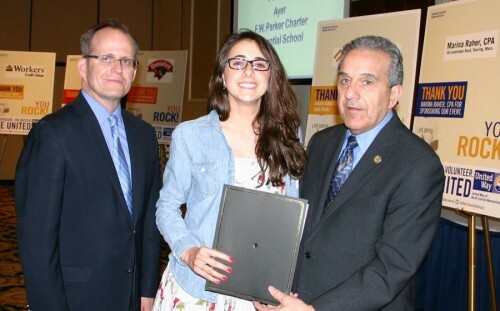 Kyrah Altman is the executive director of the United Way Youth Venture Team , LEAD, which was begun as a means to raise awareness about mental health and gun-related violence in the wake of the San­dy Hook tragedy. 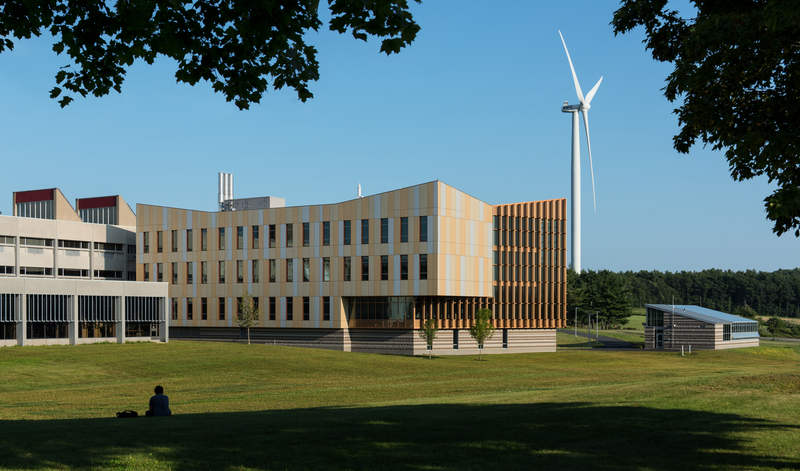 LEAD has since grown to take on many issues facing the community by hosting a multitude of events and initiatives including an annual Sandy Hook Candlelight Vigil, spa days for homeless families living in local hotels, and donating Christmas gifts to families struggling with addiction at Orchard Street House. 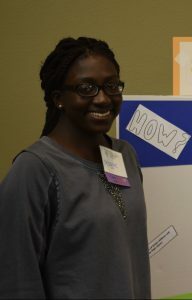 Kyrah and her LEAD teammates are making progress in implementing a brand new student-created mental health curriculum to be used in the high school next year. In the fall, Kyrah will be attending George Washington University in Washington, DC, with a focus on public health. 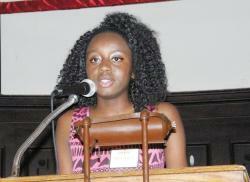 Plamedi Makelela, a senior at Leominster High School and CTEi, is one of the founding members of United Way Youth Venture Team, STRIDE (Students Trying to Rise In Defense of Equality), which is committed to gathering support for the LGBTQ community throughout their school and Leominster with a STRIDE Pride Night hosted at City Hall last spring. The Venture Team fundraises to support the Waltham House, which provides safe housing and counseling for LGBTQ youth who have met mental and physical abuse for their sexual orientation. 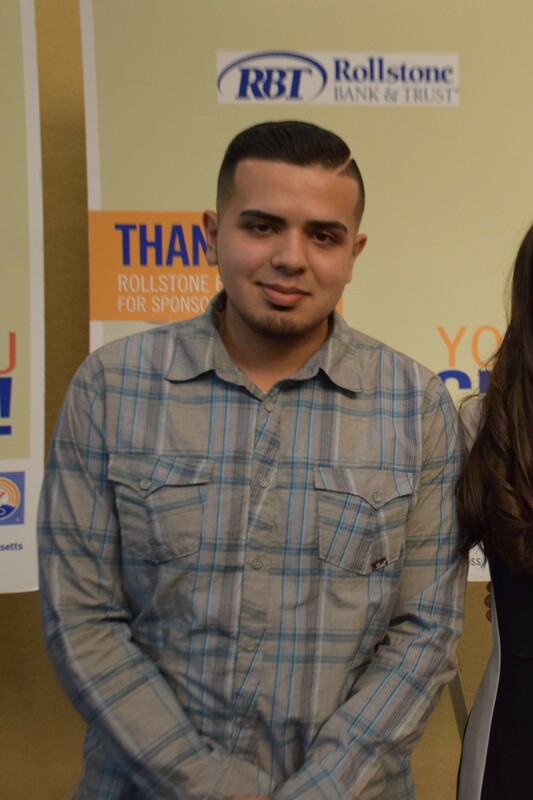 Plamedi plans to attend Northeastern University in Boston to study media production in the fall. Deryn Susman started the United Way Youth Venture Team, Sizer Cubbies, after she learned of a mother and children who were forced to flee from their home, leaving all of their prized possessions behind. Deryn and her Venture Team were inspired to help traumatized families like these, providing them with free teddy bears, and holding an annual fundraiser to bring awareness and support to the important cause. 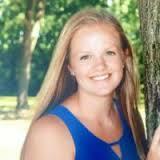 Deryn will be going to college to gain a dual degree in theater and special education. Zayna is highly involved and committed to the entire Parker school community where she is an active leader within the UWYV program at her school. By taking her skills and interest in soccer, Zayna, along with her siblings and fellow teammates, turned them into a unique Venture project called Goals For Nets, a summer soccer camp which raises money to buy bed nets for families in Africa to help prevent the spread of malaria. Through this Venture Zayna has not only aided two communities in need of her help, but she has also paved a path for her younger siblings to take up the reigns of leadership for the Venture as she takes her next step to college. Zayna embodies everything one hopes to see in a Venturer and her leadership will not soon be forgotten. Jeffrey Dike took on the task of helping starting a club at the school to foster a more positive school atmosphere by empowering the students to have a better understanding of how to end bullying at the school. This soon turned into Jeffrey’s Youth Venture, Friends of Rachel’s Challenge. 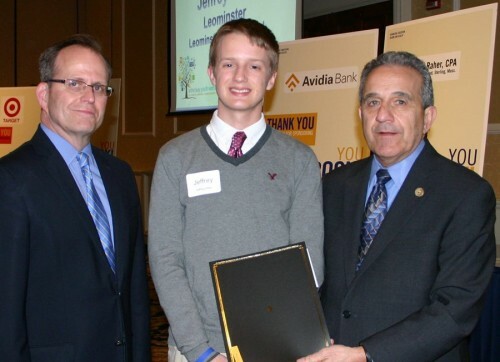 After seeing the positive impact that this club had on the student body Jeffrey took it a step further and helped turn it into a Venture project so that the club could help more than just Leominster High School. He and his teammates soon began to turn the project into a workshop that included everything from videos, ice breakers and fun activities to help better educate students on how to handle bullying. They have been able to reach out to local schools, organizations like the Boys and Girls Clubs, and conferences like the BRACE Conference at Worcester Vocational. 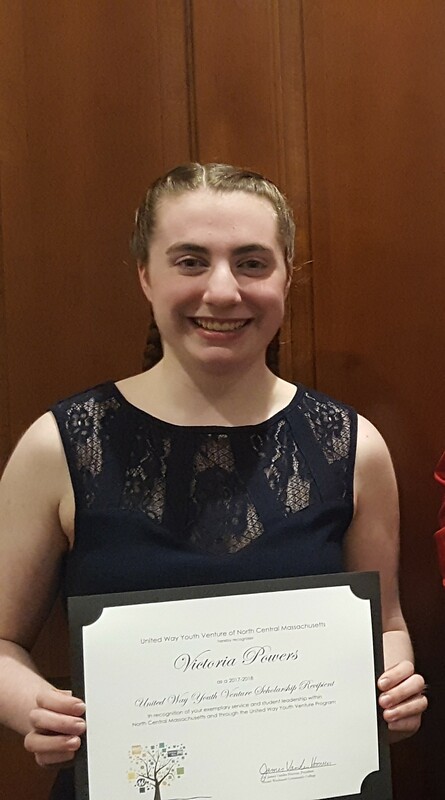 Recognizing the need to help the homeless and less fortunate in her community when she was in the eighth grade, Remie started her youth venture United We Stand For All and was able to open up a soup kitchen called the Daily Bread. There she and her teammates serve breakfast every Saturday for those in need, using the rest of the days of the week to raise money and donations to ensure that the kitchen was fully stocked every Saturday and have been doing so for the last five years. She then took this Venture a step further and for the last three years United We Stand For All has hosted a city wide dinner for Christmas, ensuring that everyone in Leominster has a full belly and company on the holiday. Not only did Remie become an active member of the Venture Friends of Rachel’s Challenge, but as a sophomore Remie also started another Venture called Mama Africa. This is a project where she works directly with the Peace Corps to teach people how to create sustainable farms. She even raises money for the people of Africa to survive as they learn to be sustainable farmers. 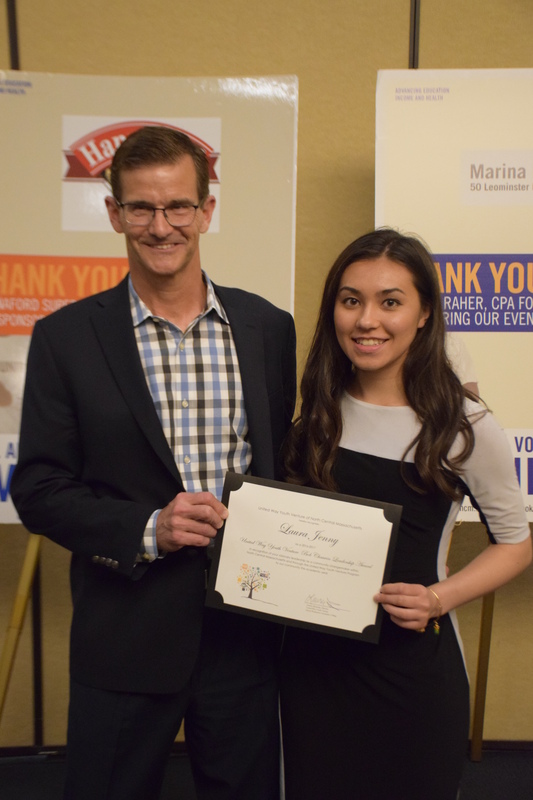 Through UWYV, Marina became an integral leader of transforming the school’s neglected courtyard into a community garden. Because of her efforts, the community can now have healthy free alternatives when they visit the local food pantry. She even went on to write a grant for the garden and was awarded $20,000 to help build a greenhouse and hydroponics facility for the gardening program. Marina didn’t just stop her service career with the garden, but wanted to do more. Through the UWYV program Marina created a program to begin an annual MLK Day of Service in the community. Her venture has engaged over 120 volunteers in service ranging in projects from painting murals for the garden and making fleece blankets for the homeless. We will look forward to hearing all of the positive impacts that Marina will continue to make as the looks to get her degree in sustainable agriculture, turning her service learning into a lifelong commitment. 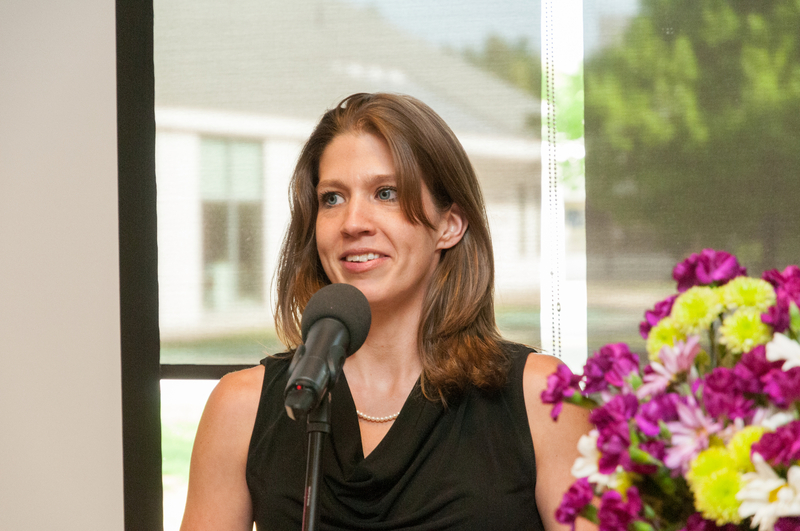 Despite already being deeply committed to serving her community, Shannon continued to find other ways to help the communities in need through her Youth Venture Simple Treasures. For Shannon, she knew that she wanted to help make a difference by helping abused women and children. However instead of picking just one community, Shannon wanted to help as many as possible. Through her work, with Simple Treasures, Shannon has been able to assist abused women and children locally in Fitchburg, in bigger cities like Boston, and even internationally in the Dominican Republic.